We are sorry that the video cannot be played in your current browser. Lui Seng Chun is an old Chinese shophouse (tong lau) originally owned by Mr. Lui Leung, a renowned businessman who moved to Hong Kong from Taishan county in Guangdong province. Designed and built by architect W.H. Bourne, the building was completed in 1931 with a total gross floor area of 600 square metres. Typical of all tong laus at the time, the ground floor of the four-storey building was used as shops while the upper floors were used as dwellings. Since the 1960s, the Lui family began to move out of the building as the family continued to grow in size. The building became vacant in the 1970s. In 2000, the Antiquities Advisory Board designated Lui Seng Chun a Grade I historic building. With the vision of preserving the building and to contribute to society, the Lui family decided to donate the building to the Government in the same year. 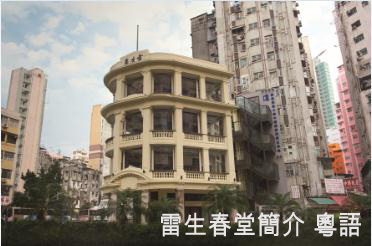 The Lui Seng Chun building was included in Batch I of the "Revitalising Historic Buildings Through Partnership Scheme" initiated by the Government in 2008 and, after a bidding process, Hong Kong Baptist University was selected to conserve the building and convert it into a Chinese medicine healthcare centre. The revitalisation work was completed in early 2012 and the clinic, Hong Kong Baptist University School of Chinese Medicine – Lui Seng Chun, commenced operations in April 2012. In terms of heritage conservation, every effort was made to retain the original architectural features as far as possible. Necessary alterations and addition works were carried out in compliance with modern buildings and fire regulations as well as meeting the operational needs of the clinic. In the process, the University adhered to the basic principle of minimising the impact of the alterations while ensuring that all alterations could be reversed if necessary.